If knowledge is divine, is it not desirable for the devout to celebrate a religious festival by disseminating information on it? Sri Venkateswara Gosamrakshanasala, the mammoth dairy farm belonging to the Tirumala Tirupati Devasthanams (TTD) management, decided to celebrate ‘Sri Krishna Janmashtami’ in a big way by creating awareness on indigenous breeds and the importance of preserving and propagating them for the benefit of posterity. Apart from the traditional religious rituals, a first-of-its-kind event is the plan to display the native breeds of cows and bulls that are a prized possession of the dairy farm. 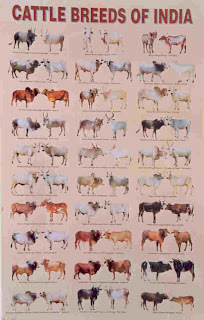 The ‘Go Samrakshanasala’ is a home to 1,600 heads of cattle, which includes animals from 12 prestigious native Indian breeds such as Kankrej and Gir (Gujarat), Tharparker, Rathi (Rajasthan), Sahiwal (Punjab), Deoni (Maharashtra and Karnataka), Umblachery and Kangeyam (Tamil Nadu), Punganur and Ongole (Andhra Pradesh), Kapila, Haryana etc. “The breeds are known for their high tolerance to adverse climate, easy adaptability to local conditions and disease resistance, while their milk has high nutritional and medicinal values,” says the dairy farm’s Director P. Harinath Reddy. While people in large numbers take part in the ‘Go Puja’ on Monday, make ‘Pradakshinam’ to the cattle and offer them chopped fodder, the authorities have apparently found the right platform to spread the message on the importance of protecting the native breeds.